There's a reason they don't make really tiny toys any longer, and it isn't because they ran out of tiny tools: kids put stuff in their mouths, noses, and ears when they shouldn't, and people get hurt. Because of this, many toys that were once considered absolutely fine for the market have been recalled over the years, while others had shoppers muttering "what were they thinking" as soon as they hit the store shelves. The Austin Magical Pistol is one of the most desirable collectibles in the vintage toy market, but it was also one of the most dangerous ever marketed to children. On the surface, the gun fired ping pong balls, and that's not dangerous, is it? Well, it depends on how you shoot them off. Nowadays, you might find a spring-loaded gun to fire these harmless balls across a room, but back in the 1940s, they gave kids some calcium carbide and let them go to town. Calcium carbide and water don't get along too well, so kids would spit into the barrel and throw in a ball, resulting in a brilliant fireball and the launching of a ping pong ball at your little sister's face (nobody really aims for those paper targets when they have a kid brother or sister). Other than the obvious concerns of providing dangerous and explosive chemicals to a kid, the gun's breech was barely screwed on and would blow off, scorching the face of the poor kid firing it with acetylene gas. That's probably not something the toy makers were looking for back then, so the toys didn't last long on the market, making them harder to find for collectors (that was partly due to them exploding all the time). These days, most states classify the Austin Magic Pistol as a firearm since it uses a chemical explosion to shoot off a projectile, so collecting them might require a background check depending on where you're from. Toy manufacturers are often on the lookout for a product that puts a new spin on an old idea. The Moon Shoes were just such a toy, and the product they took inspiration from was the trampoline (you know, that thing that causes around 100,000 injuries every year). On the surface, these seem rather benign. They are small trampolines made of rubber bands kids wear on their feet so they can jump a few inches higher, making it feel like they are bounding about on the surface of the Moon like real astronauts. Of course, nobody who ever set foot on the Moon broke their ankle walking around up there, but that's exactly what happens when you strap a couple of trampolines to a kid's feet and set them loose. Injuries aside, these things had the best warnings of all time in the instruction manual. Kids were warned against jumping indoors and especially on their beds to achieve a "double jump" effect because you know some kid tried to do exactly that. They were told to only use them outside and on hard, flat surfaces like a driveway or blacktop—great places to fall and break an elbow or an ankle. Moon Shoes were first introduced in the 1950s and were made of metal, so it's a wonder they thought it wise to bring them back in the 1990s to a much more litigious society. Kids like dolls, and they also like helicopters, so Galoob Toys Inc. married the two ideas together and created a series of dolls called Sky Dancers in the late 1990s. These dolls were placed onto a decorative base and spun rapidly at the pull of a string. Their loose arms spread out, and since they were in the shape of propeller blades, the Sky Dancers would zip up into the air and majestically fly right into your father's face, blinding him. That's not a joke. The dolls would fly, yes. But they did so erratically, and just like grapefruit juice, it tended to shoot into someone's unsuspecting eyes. The company received 170 reports of the dolls hitting people, causing eye injuries such as scratched corneas and temporary blindness. And then there were the other injuries—wounds that needed stitches, shattered teeth, a broken rib, and even a concussion. Perhaps a little more product testing might have revealed that small plastic dolls flying erratically through the air within a person's home were a bad idea. 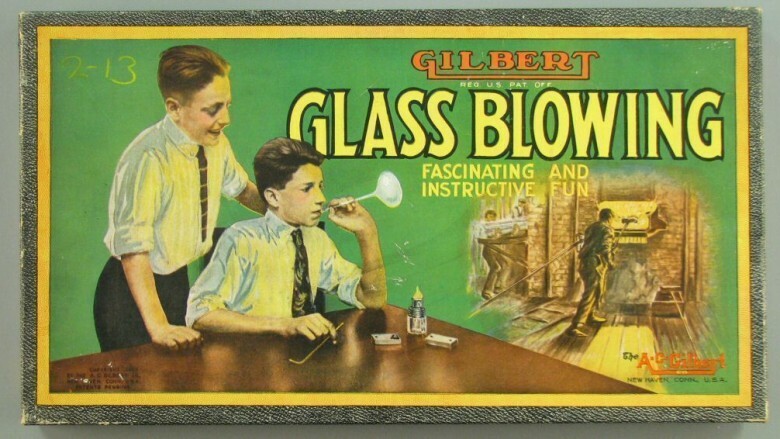 If you thought your kid could do with a new hobby and needed some new glassware around the house, then the Gilbert Glass Blowing Kit was for you! This terrifying toy was marketed as a necessary device to help children learn a valuable skill. When it was released in 1909, glassblowing was something of a practical skill needed for people interested in studying chemistry in college. That's all well and good, but we are talking about giving children a device capable of heating up the included glass tubes with an alcohol-fueled flame. The set came with 80 experiments children could conduct to learn the basics of scoring, blowing, and shaping glass objects. It was clearly more dangerous than your average stuffed animal and would never be sold to children today, but it sure looks like a lot of fun. For some reason, the kit was marketed only to boys, which may have spared many a young lady from burning herself on her homemade glass cup since the kit didn't come with any protective gear at all. It encourages children to use their bare hands when working with glass at approximately 1,000 degrees Fahrenheit. Can you imagine yourself at that age not burning down the house? We can't. Toys are made from all kinds of chemicals. Whether you abhor plastic or you're worried about lead in toy paint, it's worth being careful about. But you probably don't worry about drugs in children's toys because no one would do that, right? In 2007, the makers of Aqua Dots (also known as Bindeez Beads), kinda did. Bindeez Beads are used to make cool crafts with neat designs. Classic. But if you swallow them (you know, that thing that little kids do to basically anything they can fit into their mouths), you could go into a coma and possibly die. That's because the toys contained a chemical that the body can metabolize into GHB, the drug that causes amnesia and blackouts when used in roofies. Over four million of the toys were recalled because it's hard to make a happy toy commercial when you have to list side effects like comas and death. The Gilbert Company was all about making toys and kits for children to become supervillains when they got older … at least that's our theory. Their Atomic Energy Lab was exactly what the name implies. 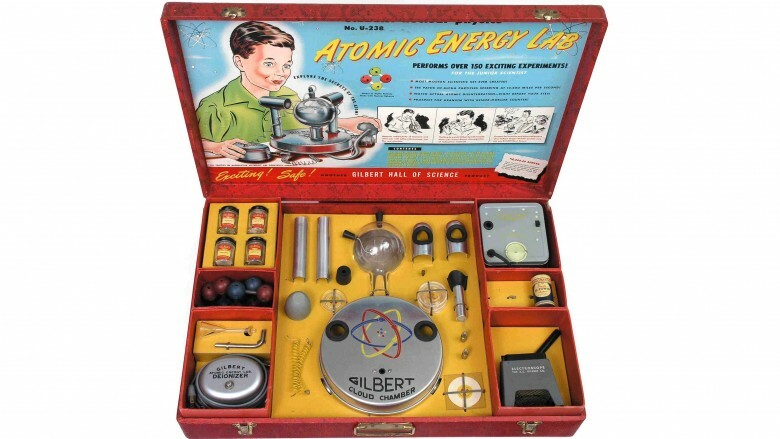 The kit came with a Uranium-238 Geiger counter, a Wilson cloud chamber, a spinthariscope, electroscope, and four samples of uranium ores. Yes, you read that correctly: the kids got a hold of uranium-238, which is radioactive. And though it's not fissile by itself, it is used to make plutonium-239 (the main ingredient used in atomic weapons). Of course, kids weren't putting together little Manhattan Projects in their garages with these samples. No, they were getting cancer. U-238 has been linked to everything from leukemia to lymphoma and Gulf War Syndrome. It's not something that should be handled lightly and it should never be put into the hands of children who just want to learn about atomic energy. This set was released back in 1950, five full years after the only two atomic bombs were ever detonated during warfare. You would think Gilbert might have looked up the dangers of the stuff. The kit was pretty expensive. It cost around $350 in today's money, so few people bought it for their eager young supervillains, and it was discontinued after only two years. You might have seen slap bracelets — they were all the rage in some schools in the early '90s. They were cool, kinda weird-looking, and you literally put them on by slapping them onto your skin. Talk about badass — you're slapping yourself. But of course, they were taken out of schools pretty quickly because they were dangerous. The slapping wasn't the problem, it was the bracelet itself. The bracelets were a flat strip of metal covered in colorful fabric or paper, but the edge of the metal could rip through the coverings after enough uses. This would leave a sharp metal edge exposed – a schoolyard shank, basically. Schools were wise to intervene and slap these bracelets with restraining orders. Perhaps you remember these things as Lawn Darts or simply Jarts, but most remember them as tiny javelins of doom and the reason your uncle still has that funny limp when he walks. 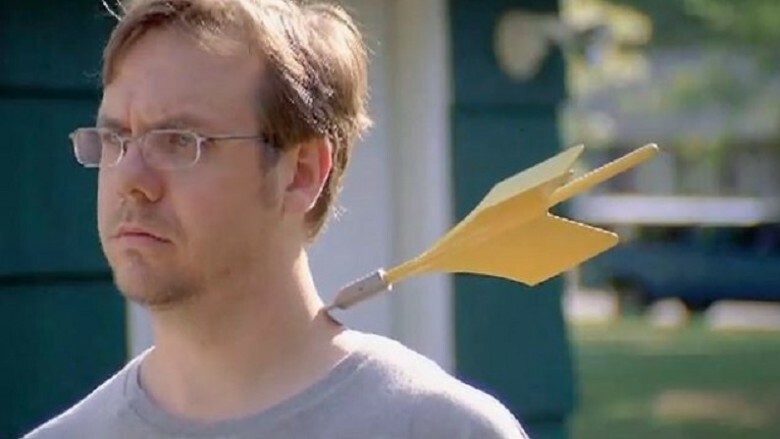 Lawn Darts were banned in 1988 for obvious reasons. While the game could be fun—you'd stand away from a target placed on your lawn and lob the darts at it from a distance—it was incredibly dangerous. People who had these things jabbed into their skulls and other parts of their bodies probably would have preferred not to be impaled. In eight years, 6,100 people playing these were rushed to the emergency room, and most were kids. There were even three deaths attributed to this deadly amalgam of horseshoes and darts. 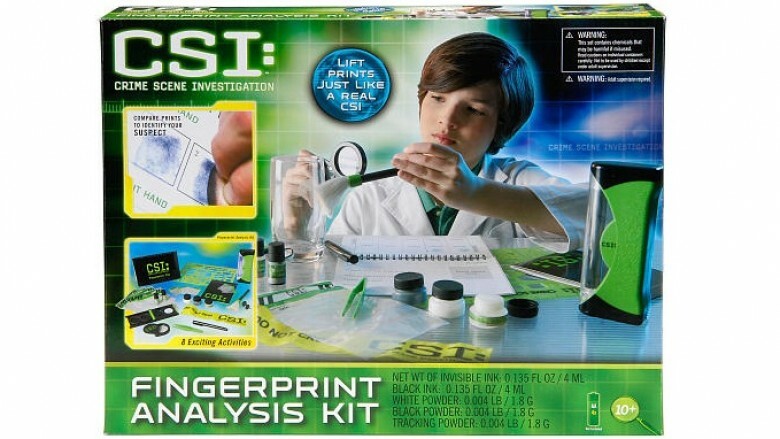 CSI has certainly been a popular series on television, so it's no wonder they created games to promote the series. That alone wouldn't be a problem, but the issue here isn't that these kits help children imagine one day becoming the person who samples bodily fluids off of corpses, it's that they included something deadly in the kits themselves. You know those commercials that come up on television all the time asking if you suffer from something called mesothelioma? That's the disease you get when you inhale asbestos fibers, which is exactly what they included in these sets. The fingerprint set contained asbestos in the powder used to dust for prints. It took 20 months for CBS to agree to a settlement in the class action lawsuit and finally issue a recall of the toy. It was never made clear why asbestos was included in the fingerprint powder, which could easily be inhaled, but many consumers blamed China since the game was manufactured there. Maybe CBS can come up with a game to test children to see if they were poisoned with asbestos—it's practical and would probably sell well given this fingerprint fiasco. Whether people called them knockers, click clacks, clackers, or any other similar name, this toy was nothing more than two acrylic balls attached to a long piece of string. A person would take the string in the middle and jerk their hand in an up-and-down motion to get the balls to swing into each other, which delivered a rather satisfying banging sound that drove your parents absolutely insane. Swinging small acrylic balls about at high speed may seem like a safe activity to most people, but the problem with these arises when those balls reach their inevitable breaking point. After a while, these things would wear down. They'd to slam into each other hard enough to shatter. When you expect a satisfying "bang" and instead are given splintered ball bits in your eyes, you might not be playing with the safest toy in the world. These little guys were made in the 1970s and didn't make it very far into the following decade due to most parents' desire to keep shrapnel out of their kid's faces. Toy guns can be dangerous for a variety of reasons, but most often these days, it's when a police officer confuses them for the real thing. That's one of the reasons toy companies started making them out of different colored plastics or placed bright orange pieces at the ends of their muzzles. Back in the day, toy guns looked just like real guns, and the Belt Buckle Derringer by Mattel was one such plaything. This gun was the same size as a real derringer and was fashioned into a belt buckle. It fired a spring-loaded plastic bullet, which was loaded into a brass shell. The bullet could fire about 12–15 feet from the gun and was about the same size and shape as a .22-caliber rifle slug. Now, it isn't necessarily a dangerous toy because it looks and acts like a gun. It's dangerous because it's a gun you fire from your junk and can lodge a small bullet into a person's eye or down their throat. The eye was most often the unfortunate recipient of this plastic, crotch-shot round of fun, which made it particularly dangerous. Also, you needed to load an explosive cap into the gun so it would make the appropriate "bang" sound. It's up to you how close you want to put an explosive to your junk, but for many people, this was something of a deal-breaker. Remember back in the day when you could fire a cool little missile out of a G.I. Joe or Star Wars toy without worrying about popping out your kid brother's eye? Sadly, those days are long behind us, and their disappearance has a lot to do with toys like the Battlestar Galactica Colonial Viper. The ship would fire off a plastic missile, and like any spring-loaded weapon of destruction could, it would lodge in children's throats or hit them in the eyes. Unfortunately, a four-year-old toddler named Robert Jeffrey Warren died in 1978 after placing the nose of the toy into his mouth and accidentally firing the missile down his throat. 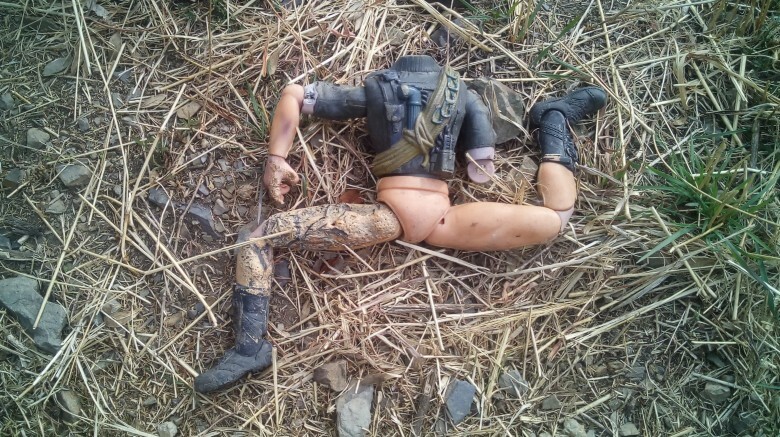 After this incident (and a few others reported to the Consumer Product Safety Commission), Mattel put warning stickers on all their products capable of firing deadly missiles. The product safety stickers even had an effect on the baddest, most deadly assassin known to exist in any universe: Boba Fett. The original Boba Fett toy was supposed to have a missile that could be fired from a pack on his back, but due to the problems arising from the Battlestar Galactica line of toys, it was decided to remove this functionality. The only versions of that dangerous toy capable of firing a spring-loaded missile were prototypes, making them extremely rare and valuable collectibles. Have you ever seen one of those Child's Play films that feature the horrific doll Chuckie and his love of murder? Ole' Chuckie has got nothing on the Cabbage Patch Snacktime Doll because while Chuckie is a cool character, he isn't real and he doesn't chew the fingers and hair of young children. It's a pretty cool doll on the surface—you feed it veggies and French fries while it constantly chews the items down into its belly. Hey, it's better than those dolls that wet and poo themselves. Unlike those incontinent little bastards, these Cabbage Patch dolls are insatiable, so they never stop chomping. That's where this goes from adorable to horrible because numerous incidents came out where the doll would get a hold of a young girl's hair and chomp away until it pulled it right out of her scalp. Little girls love their hair, so that's traumatic enough, but those unfortunate children who got their fingers stuck in those insatiable jaws may never be able to feed a real baby after undergoing that horror. If there's one thing parents know, it's never to leave small magnets and their children alone. If a kid swallows a magnet, it's not a big deal. They are generally non-toxic and will pass through their systems without a fuss. The problem arises when that second magnet is swallowed. The stronger the magnet, the more dangerous it gets because once one finds another, they tend to want to meet. They don't care if the lining of your stomach or an intestinal wall is in the way, and the result is often a painful and potentially deadly bowel obstructions or perforation. 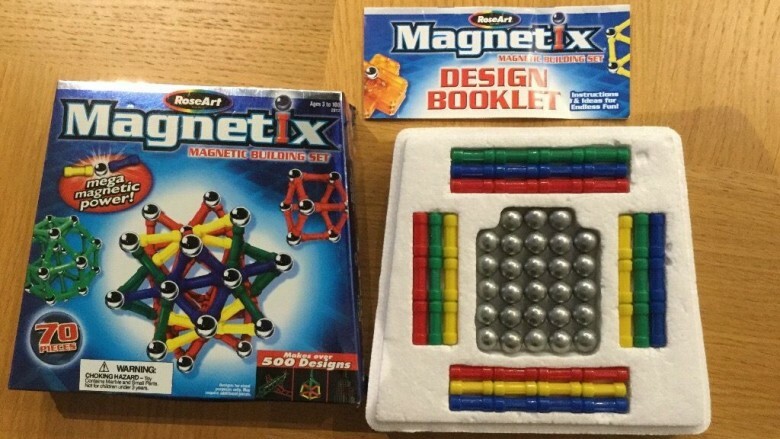 That's what Mega Branda America, Inc. learned when the Consumer Product Safety Commission demanded a recall over their Magnetix Magnetic Building Sets in 2007. The kit includes 0.5" steel magnetic balls that are used to join the plastic building pieces together. These building sets were probably find for older children, but ask any parent, and they will tell you toddlers love to put anything they can into their mouths. More than 3.8 million units were recalled after a 20-month-old boy died swallowing magnets that caused a bowel obstruction. Forget the magnets and go back to Lincoln Logs. Hardly anyone was ever hurt by those. As a kid, you might have enjoyed Creepy Crawlers, aka "EZ Bake Oven for kids who liked gross stuff." Pour goop into a mold, use a plastic scoop to slide it into the oven, and make rubbery bugs to throw in someone's hair. It was as safe as anything heated under a powerful light bulb could be, but decades ago there was much more risk involved. 1964's Thingmaker, which introduced Creepy Crawlers, was basically the same thing: you put goop in the mold, and made creepy, kooky, mysterious, spooky, and altogether ooky bugs and spiders. But unlike the safe, colorful, '90s version that spawned a Saturday morning cartoon, the Thingmaker cared naught for a child's safety or enjoyment. There wasn't a big, plastic scoop to easily slide the mold into the oven, but there were small metal tongs. You (very carefully) slid the mold into the metal oven, but it wasn't powered by light bulb. Instead, it was plugged right into the wall. That made it almost as hot, if not hotter, than an actual oven. Once the bugs were done, you removed the metal molding tray from the metal oven, using metal tongs. Yes, there was a cooling tray, but that was still piping hot metal coming at you from all sides. And kids are careless at best, so it's no small wonder that, when they reinvented the Crawlers for '90s kids, safe spookiness became all the rage. The Aqua Leisure Inflatable Baby Boat was just what it sounded like: an inflatable boat that babies could sit in and pretend to be Captain Ahab. They were certainly adorable, but there was one other problem: they were super-dangerous. See, according to the Consumer Product Safety Commission (CPSC), the boat's leg strap could easily snap apart, sending the baby sliding right down into the drink. In other cases, the seat itself would rip, sending the baby either into or close to the water. Thankfully, it doesn't seem that any children actually died, though several dozen were affected and put at risk of drowning. Worse for Aqua-Leisure Industries, the company behind these boats, is that it knew about these issues as early as 2002 and did nothing. So not only did it lose money in the 2009 recall of over 4 million boats, it was fined $650,000 by the CPSC in 2012, for failure to report. Probably the only reason the company got off that lightly is because no baby actually died. Had any, we might be speaking of that company in the past tense right now. The Sky Rangers Park airplane toy was a pretty basic radio-controlled airplane. You powered up the battery pack in the plane's tail, launched the plane by hand, and let the radio handle the rest. That's fine, but this was a rather dangerous toy underneath. This particular battery had a knack for exploding before or during launch — according to the CPSC, there were 45 reports of exploding planes, resulting in injuries to the eyes, ears, hands, face, and even chest due to debris flying everywhere. There were also reports of temporary hearing loss, which makes sense considering these were serious explosions. In 2007, Estes-Cox, the company behind the Sky Rangers plane, issued a voluntary recall (aka "we'll get sued if we don't") of over 21,000 planes. Not every Park Flyer plane was recalled — if there was a warning sticker near the on/off switch, it was okay. The plane might still explode, but at least they gave you a heads-up. 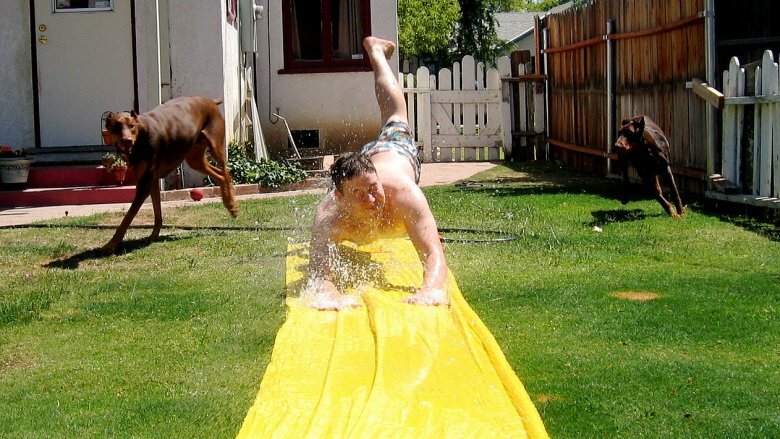 Who didn't love their Slip 'n Slide as a kid? Running and sliding headfirst into water was the perfect way to cool off your childhood. The problem was, if anyone other than a child used it, they risked slip-sliding straight into a concussion. According to the CPSC, if an adult or teenager were to use various Slip 'n Slides produced before 1993, they risked barely sliding at all, instead just hitting the ground hard and staying there, as their body's weight would be too great to actually allow any sliding. From there, as put so gently by the CPSC, "The slider's forward momentum drives the body into the neck and compresses the spinal cord." This wasn't an exaggeration: between 1973 and 1991, at least seven adults and one teenager suffered severe injuries, including fractured necks, paraplegia, and even quadriplegia. Nobody wants to risk full-blown paralysis from playing on a kid's toy, so WHAM-O wound up recalling over nine million slides. Slip 'n Slides are still a thing today, but now they make it perfectly, 100 percent clear that nobody over the age of 12 should use them. Anyone older than that should find another way to cool off. Like go in the pool. Of all the dangerous toys in the world that could harm your children, you'd think Polly Pocket would be on the bottom of the list. They're so cute and innocent, and besides it's just a bunch of dolls and a playhouse. What could possibly go wrong? Plenty, as it turns out. 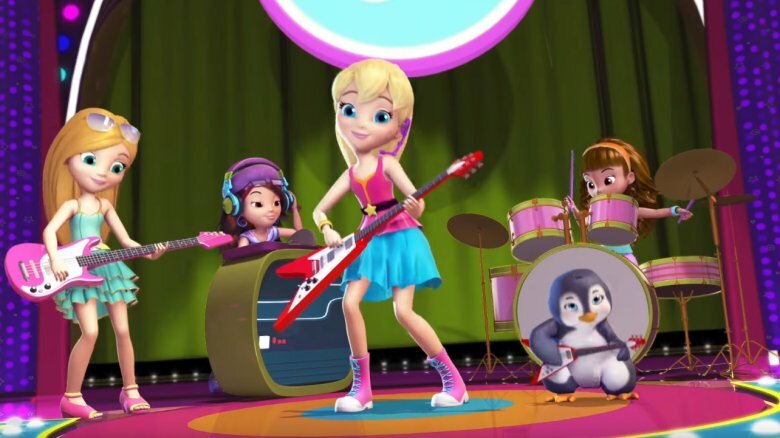 According to the CPSC, Polly Pocket play sets sold between May 2003 and September 2006 were at risk of having the magnets inside the toys come loose. Young children, being young children, could then eat the magnets or stick them in noses and ears, which is bad enough on its own. But if they swallow more than one, the magnets could actually attract each other inside the body, risking severe blockage, infection, or intestinal perforation. The CPSC mentioned around 170 cases of rogue magnets, which resulted in three cases of hospitalization for children ages 2, 7, and 8. Mattel recalled millions of play sets. Polly Pocket is still a thing, so presumably Mattel has been trying super-hard not to have their magnets run away on them again. It's bad both for their bottom line and kids' insides.